Costume Shop Manager Susan Davis grew up abroad—Japan, Ethiopia, Egypt, among other places—and inherited her mother’s love of beautiful textiles. By her college years, she had taught herself to sew, got her first job in a costume shop, and a career was born. She first came to seattle in 1989 to work in Seattle Opera’s costume shop as a cutter. Several years later she co-founded her own company, Period Corsets, which sold handmade undergarments designed for use in theaters, and it was through this work that she learned the nuts and bolts of running a sustainable costume business. 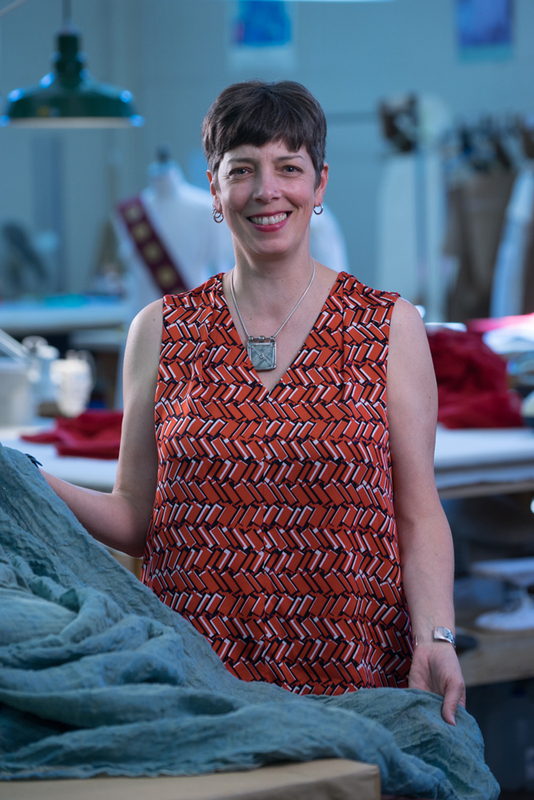 Since 2002, she has run Seattle Opera’s costume shop with the same eye for detail and an amazing capacity for coordinating her extraordinary team to make a bolt of fabric into the exquisite symbol of a character. When did you first meet with Ginette Grenier, the Costume Designer of Nabucco? I met Ginette in New York in April. We spent the week walking the garment district, looking for samples and selecting the fabrics. It’s a great way to get to know the designer because we’re together 15 hours a day, three meals a day, coffee break if we’re lucky. We worked late into the night every night. I hadn’t worked with Ginette before, so I had to get a sense of her work style and her aesthetic—what colors and textures of fabrics she is drawn to. Sounds like a whirlwind! How many stores did you go to? Thirty or so...and we visited each several times throughout the week. On Saturday, Ginette flew home, and I had the last-minute things to go purchase. I probably went to seven stores and bought things at each store. Do you usually do that kind of a trip with the designer? Yes, for a new build, though sometimes we shop in L.A.. We go store after store and we cut samples. I can’t choose on my own—it’s her vision—and she can’t choose on her own because she doesn’t know budgets or if we need 50 yards or 15 yards, that sort of nuts-and-bolts work. She is the artist. Any of that practical stuff is me. Can you tell me some of the ideas behind the Nabucco costumes? We’re making a clear visual distinction between the Babylonians and the Hebrews. The Hebrews are in more earthy colors and browns and natural fibers and linens and cottons. The Babylonians are in royal blue with gold accents; you can tell they’re more well off, the rulers. The Costume Shop sometimes does painstaking research to make sure the costumes are historically accurate. Is that happening here? This show is more suggestive. It’s really a world that Ginette and Stage Director François Racine have created, inspired by real images, whether that’s paintings or textiles from days gone by. This means the cutters can add some creativity, which is fun; whereas if you’re making a nineteenth-century frock coat, the seams are in the same place no matter which frock coat you look at. What’s the ideal reaction from a singer when she steps into her costume? The best times are when the singer looks in the mirror and says, “Oh, I totally feel like [fill-in-the-blank character]... You nailed it.” That’s the most gratifying. Our goal is to have the costumes enhance the performance experience on several levels: for the singer who is wearing it, for their colleagues onstage with them—we want Abigaille to recognize Nabucco—and of course for the audience. This Staff Chat first appeared in Seattle Opera’s program for Nabucco in August 2015.